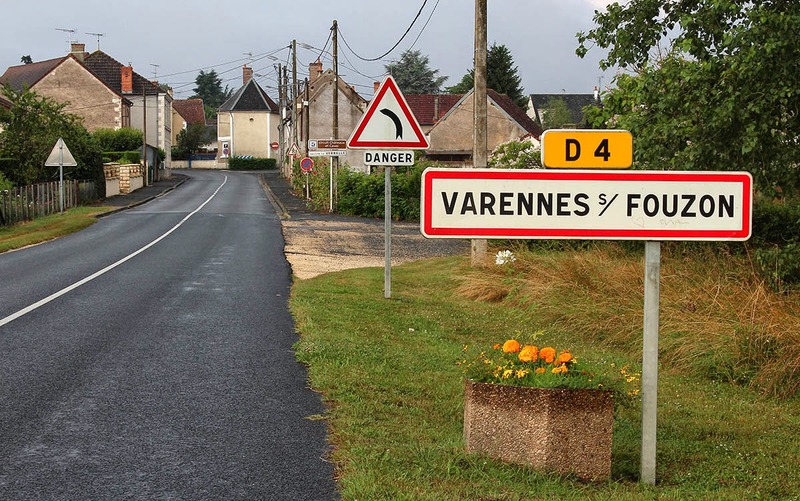 Not far from the château at Valençay is the small town of Varennes-sur-Fouzon. It's not a place we knew before we met L. & J. from Arizona. 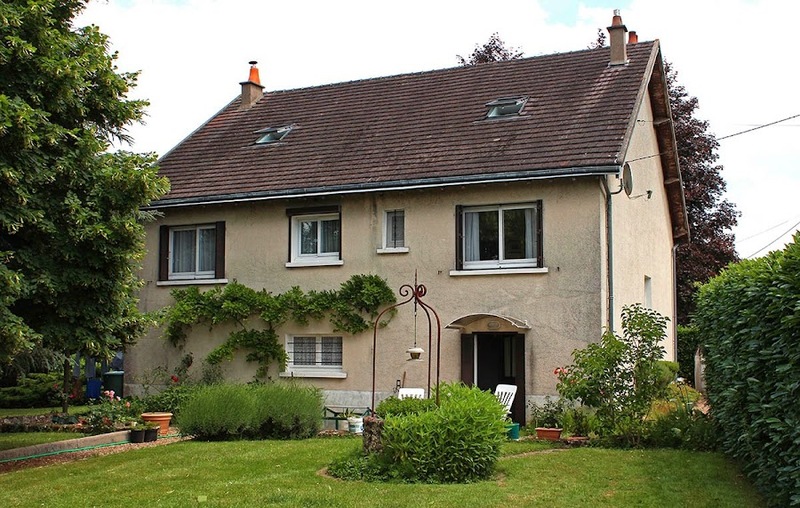 They have rented a vacation house in Varennes several times over the years. This past weekend, they invited us for lunch. Saturday's meal started with tasty stuffed mushrooms, followed by chicken Marbella and a lovely risotto. After salad and cheese, we capped it all off with an apple tart. The main road through town. As will happen, we continued enjoying the afternoon with wine flowing freely and eventually found ourselves gathering around a campfire as the evening darkened. Our friends offered a bed for the night as we were not in a good condition to drive. We enjoyed a hearty breakfast of eggs and sausage on Sunday morning before setting off for home. Just before breakfast, I got up and out for a walk with Callie. The town on Sunday morning was very quiet and pretty, and I had my camera. The title of this post is a reference to the 1982 film, "La Nuit de Varennes," which tells the story of king Louis XVI's and Marie Antoinette's attempt to flee France in 1791. They were intercepted and arrested in the town of Varennes-en-Argonne in the Lorraine region, then taken back to Paris to stand trial before being executed. Well, I didn't prepare a blog post for this morning. So I wasn't prepared when we ended up staying overnight at the vacation home of some friends. There may have been some wine involved. And lots of merry-making. We did the prudent thing and didn't get on the road after midnight. We're very grateful to L. and J. (and H. and R.) for their wonderful hospitality. 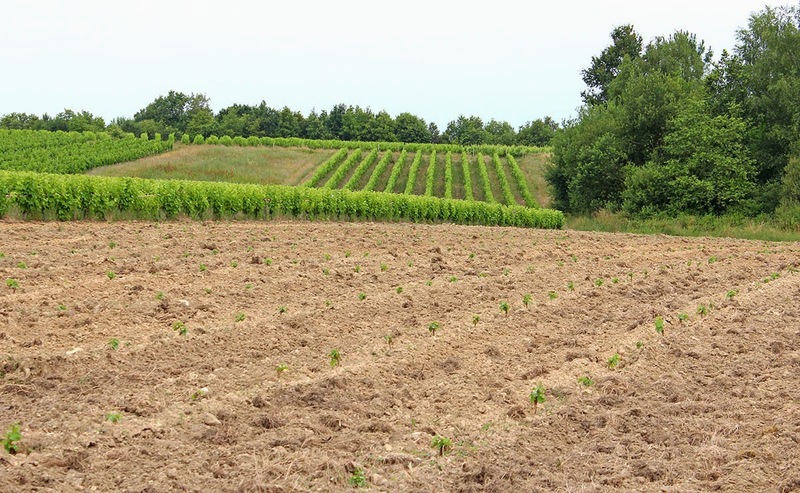 A brand new vineyard next to the old favorites. See the little grape vines in the foreground? The vineyard is in flux. 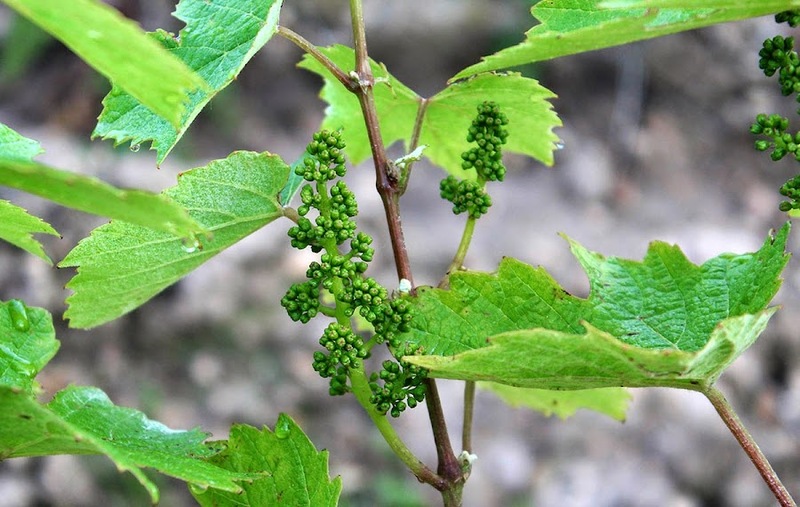 The grape vines are growing rapidly, the flowers are setting fruit. And the growers are out trimming. There is also a new parcel planted with grapes. Exciting! Nice and neat. And the sun gets to shine on the growing grapes. 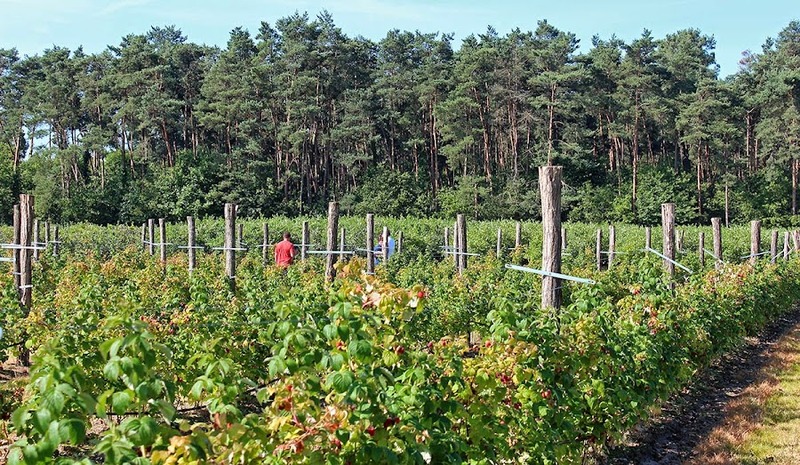 The photo above shows how the vines are pruned in the growing season. 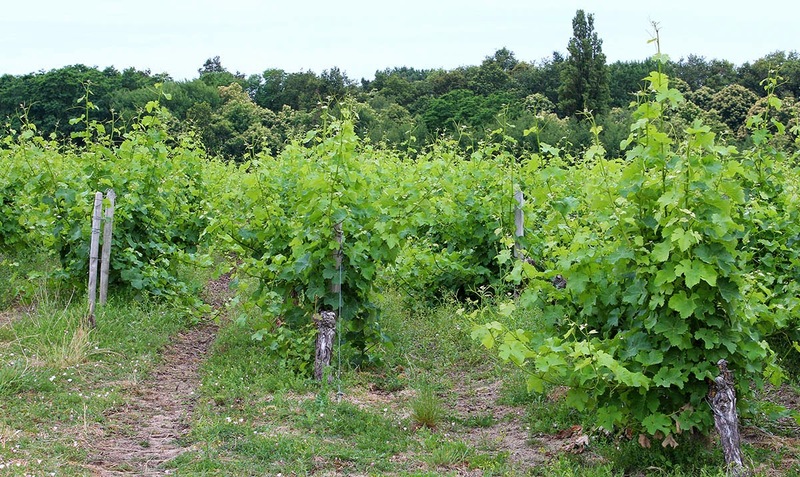 Long tendrils are cut back so the vines' energy goes into producing grapes and not leaves. It's very pretty. The photo below shows what the vines look like before the pruning. Wild, eh? The tendrils reach out in all directions. Impossible to walk between the rows. 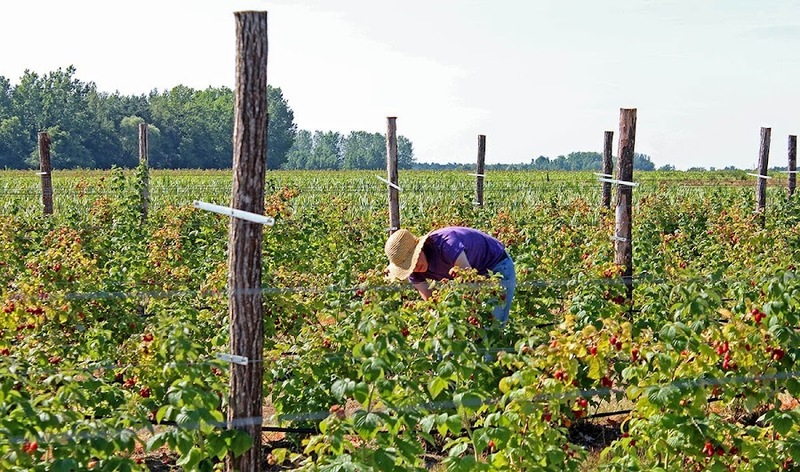 The pleasant surprise at the blueberry farm was that they had planted a whole field of raspberries. After picking two whole buckets of blueberries, Ken and I borrowed a container from our friend K. and picked some raspberries. I probably ate as many as I picked. Shame on me. Framboises. Don't they look amazingly good? Along the way we met a British woman who lives nearby. She recognized us from our blogs and introduced herself. We felt a little like celebrities. Christine was very nice and we enjoyed talking with her. The blogging thing is abstract on a day-to-day basis. You write stuff and publish pictures, but when you actually meet someone who reads it regularly, it becomes something else. Very nice. Picking raspberries in the morning sun. It was not at all hot out. Very pleasant. We ate half the raspberries while they were fresh. Yummy. Then I froze the remaining half. We'll use those to make frozen yogurt or ice cream in the coming weeks. And I have to say, they are delicious! We will certainly go back next year for more. 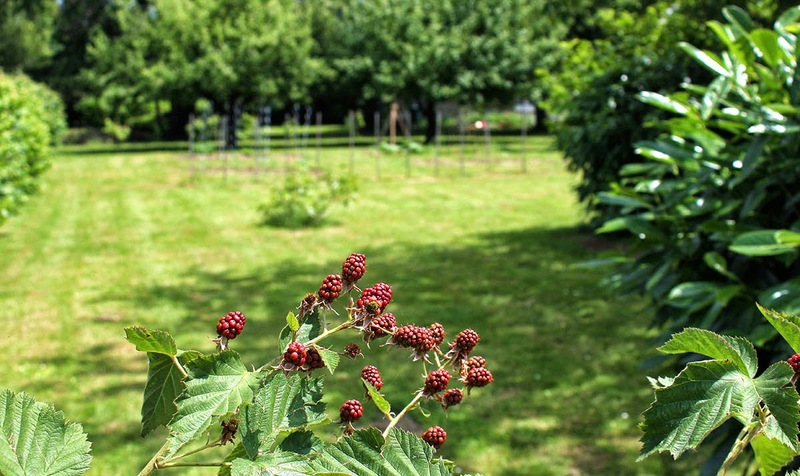 Raspberries in front, blueberries behind, then a big stand of conifers. 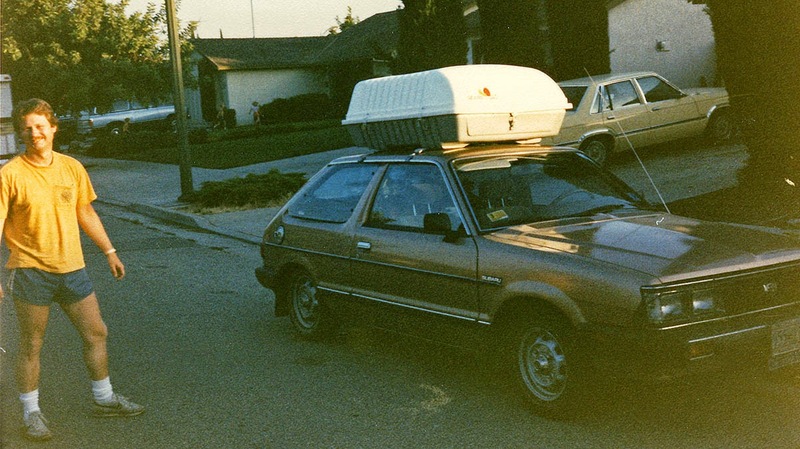 This is another photo from summer 1986 when Ken and I moved to California. We had gotten everything unloaded and removed the cartop carrier. I wanted to wash the car after its week-long trip from Washington, DC. We were enjoying the hot California sunshine and the fact that the air was dry and not at all humid. If you've been in DC (or pretty much anywhere on the US east coast) in August, you know what I'm talking about. Me and my Subaru. Remember mud flaps? Do cars still have mud flaps? 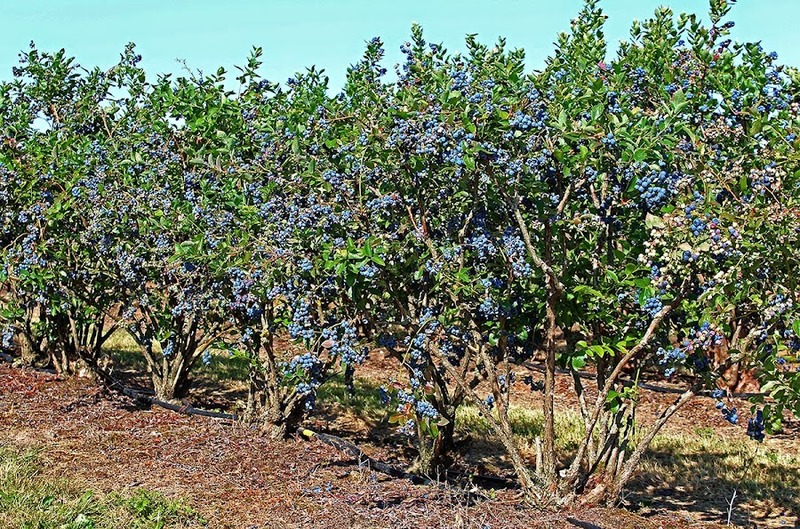 On Tuesday, Ken and I and our friend K. drove up to the local myrtille (blueberry) farm for a morning of pick-your-own fun. I did this last year with great success (we're just now finishing the berries I froze last July), so I was looking forward to more of the same. I was not disappointed. The morning was bright and sunny and cool. The pickin' was easy! The berries were ripe and plentiful and picking them off the bushes was pretty easy. Ken and I filled up our buckets with more than eight kilograms of berries, over seventeen pounds! Today I will wash them, pick the stems out, and freeze most of them in zip-top bags for use in the coming year. Of course, we plan to eat some fresh ones, too. Ripe berries were abundant; we timed our visit just right. 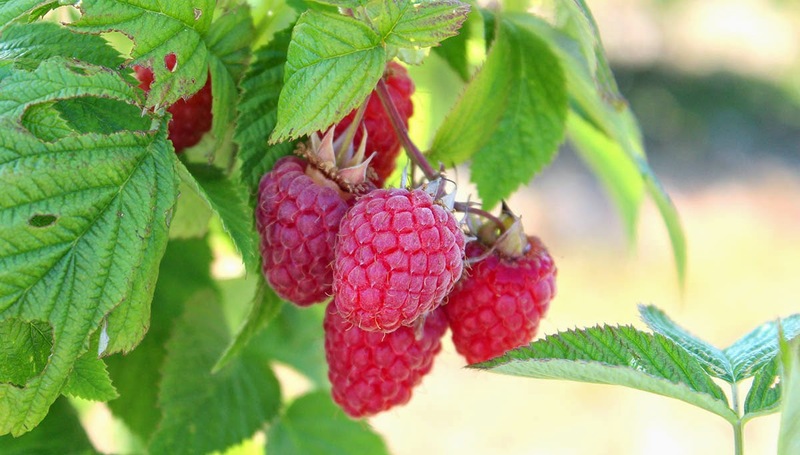 A new feature at the farm this year was section of pick-your-own framboises (raspberries). Wow. The bushes were heavy with plump and juicy fruit and we picked 800 grams, nearly two pounds. I think we ate half for dessert yesterday and the rest went into the freezer for making ice cream or frozen yogurt in the days to come. I'll post photos of the raspberries soon. It didn't rain much, but it did rain on Monday. It's good for the grass, but also good for the weeds. Still, I got some work done in the vegetable garden. I planted a second row of green beans. I'm following the successive planting method so that, if all goes well, we will have new beans when the first beans are done. I plan to plant a third row in another week. These are little morning glory types of flowers. 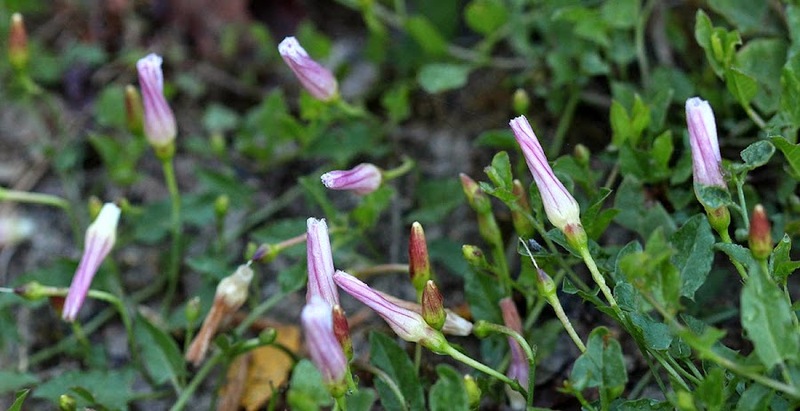 They open up in the sun, and close up at night. Tiny, but very pretty. We harvested a bunch of chervil, too, which we used in making stuffed grape leaves, or dolmas. Ken picked thirty-five leaves from the grape vines in our yard. That's pretty much all they're good for, as they don't produce very many grapes. We also harvested some mint for the stuffing. Ken made the stuffing with ground beef, rice, and the herbs. I stuffed and folded the leaves. They're cooking in the oven as I type. Can't wait to taste them. The grape vines are in flower now, but the flowers are quickly being replaced by tiny grapes. 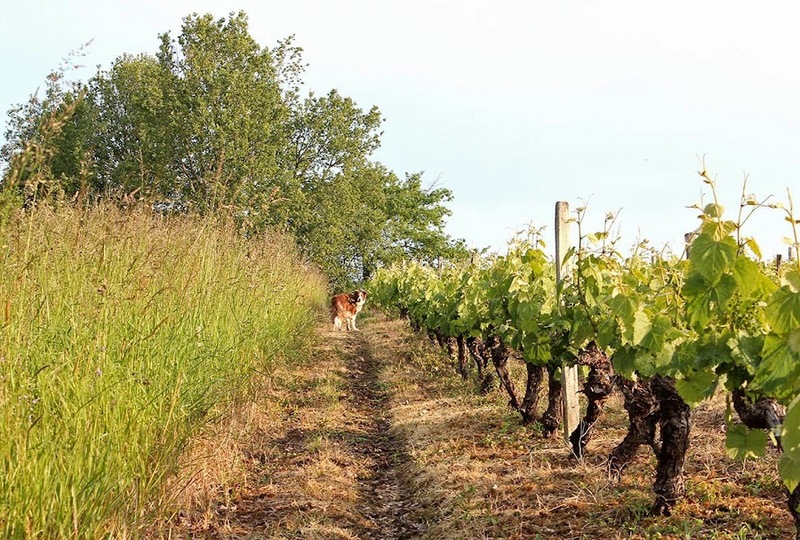 The vines themselves are growing like crazy and walking between the rows is like negotiating a jungle. I've noticed that the growers are starting to trim the vines now so that the plants' energy goes into the fruit and not into extending their reach. The trimming is done by machine and afterward each row is neat and uniform, giving the vineyard a very manicured look. I'll try to get a photo of that soon so you can see the difference. 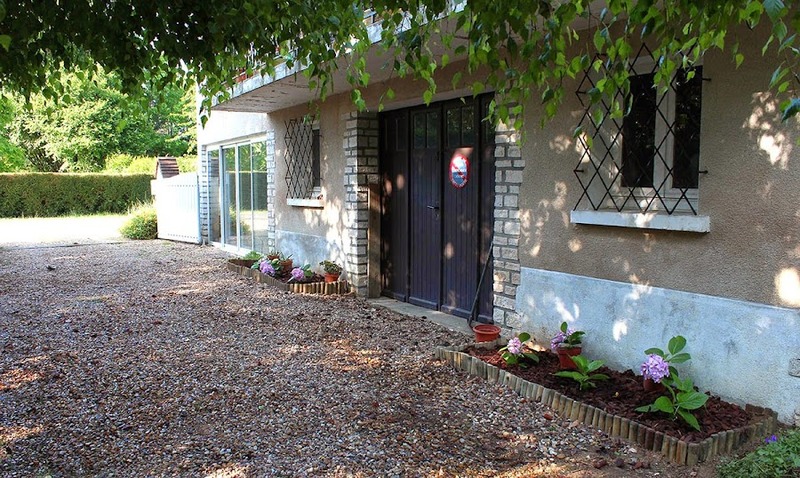 Today is overcast and southwestern France is under thunderstorms and rain. The system is expected to bypass us, but we might see a stray shower or two over the course of the day. 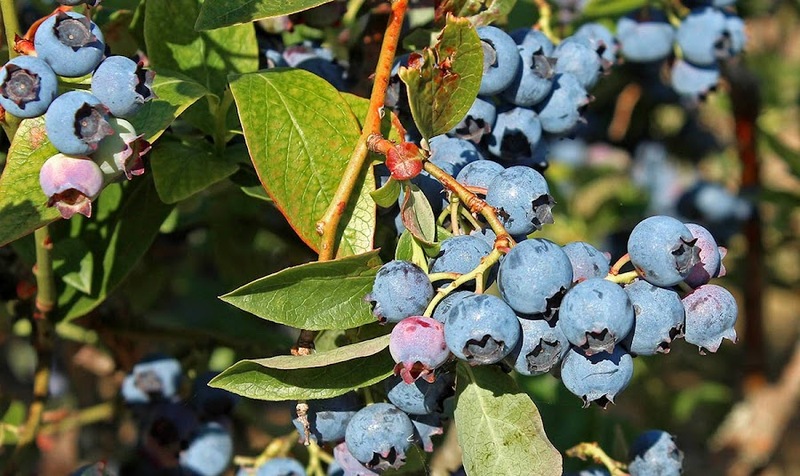 Tomorrow the sun is expected back and we have a date to pick blueberries at a local farm. We're enjoying lovely weather right now. It's good for working in the yard in the morning, then good again for hanging out on the deck in the afternoon. Not that we work all that hard. I did get the mulcher out and ground up some of the hazelnut trimmings. There's a lot more to do, but I think it's worth it for the compost. 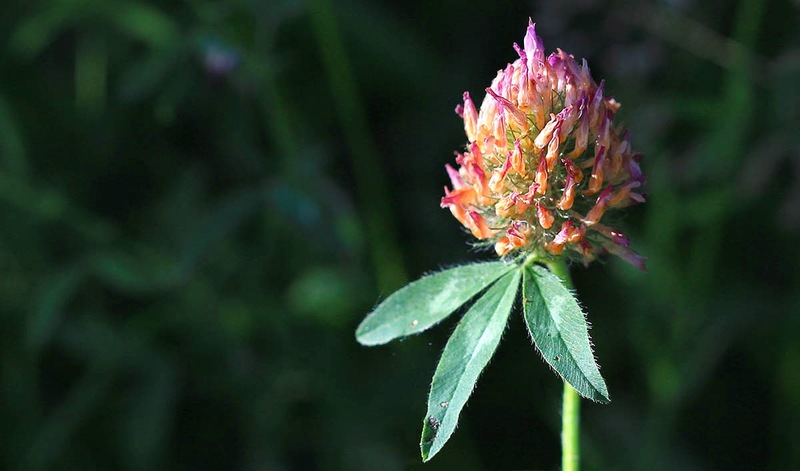 One of hundreds of clover flowers I pass on my walk with Callie every day. The Wimbledon tennis tournament starts on Monday. I will be watching. And the Tour de France bicycle race starts in two weeks on the fifth of July. They're starting in England this year. Go figure. And then there's that World Cup thing going on. Although I'm not paying all that much attention to that. Still, France hasn't been eliminated. Yet. It's here. And so is the sun, although by no means could you call it "hot." Our highs right now are in the low-to-mid 20sC (low-to-mid 70sF). Comfortable, but not hot. And certainly not humid. And we're certainly not complaining. Blackberries (not yet ripe) grow along our back fence. This is looking east, into our garden. We repaired the electrical extension cord that I sliced the other day. It's now about a meter shorter than it was, which was 50 meters originally, I think. Next I have to decide whether to try and mulch the hedge trimmings for compost (with the grinder) or just chuck 'em over the fence. Summer is about to begin. Astronomical summer, that is. The solstice is tomorrow; my second favorite day of the year. My first favorite is the winter solstice, which also happens to be my birthday. So I'm hoping that we'll have a good summer. Both for the vegetable garden and for sitting outdoors in shorts and tee-shirts. The wisteria is done flowering for now. The lavender is getting ready to bloom. This is the back side of our house as it looks right now. It faces due west and takes most of the weather (rain, wind, storms). We sleep up under the roof, near the attic window on the left. When summer thunderstorms rumble through, we hear them as if we were up inside them. It's not the best photo, but it was an important moment. This was taken (by Ken, I think) just after we arrived in California in August 1986, the year we moved from Washington, DC. 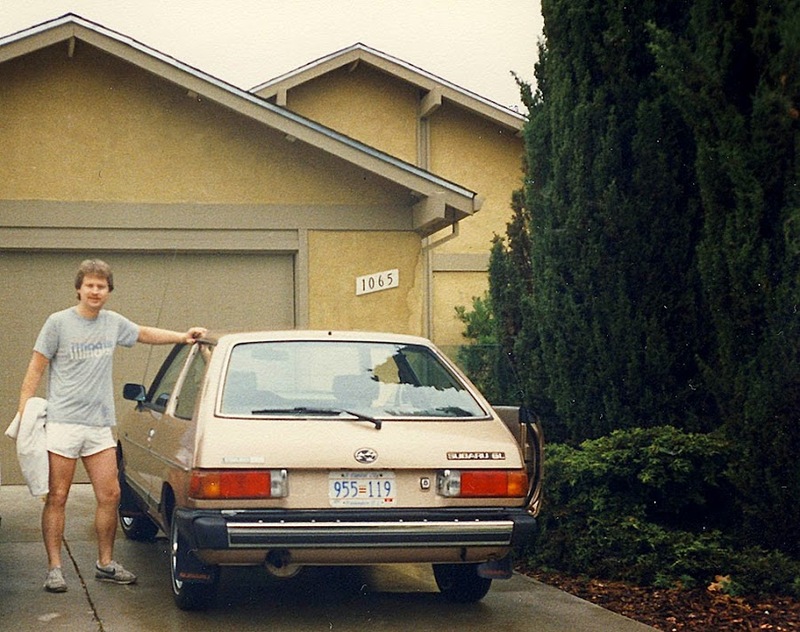 We drove my Subaru across the country to San Jose, where friends C&J lived. They were very gracious to let us stay with them as we got settled. It's a long story, but we were, and still are, very grateful for their generous hospitality. We made it! My good old Subaru hatchback, with the escargot on top. I was 26 years old. We packed the hatchback as full as we could get it, along with a car-top carrier that was called an "escargot." Kind of like a snail's shell on the top of the car. We were moving me and my stuff since I was going back to school and needed to be in the Bay Area for classes. Ken spent a week or so, then went back to Washington for another month to finish up his job before moving out. I flew back to DC and we rented a truck, packed our furniture, put Ken's car on a trailer, and finished our move to California in October that year. They said, "Californy is the place you oughta be." So we loaded up the truck and drove to Silicon Vall-ee. San José, that is. Swimmin' pools, computer nerds. Earlier this week, while I was out taking photos in the garden, I heard Bertie meowing outside the hedge. I went out to see him. He suddenly got very excited and walked around like he was taking me on a tour of the outdoors. At one point he was almost bounding around with enthusiasm. He took sudden turns to go off in new directions, but not very far, all the while making sure I was following. 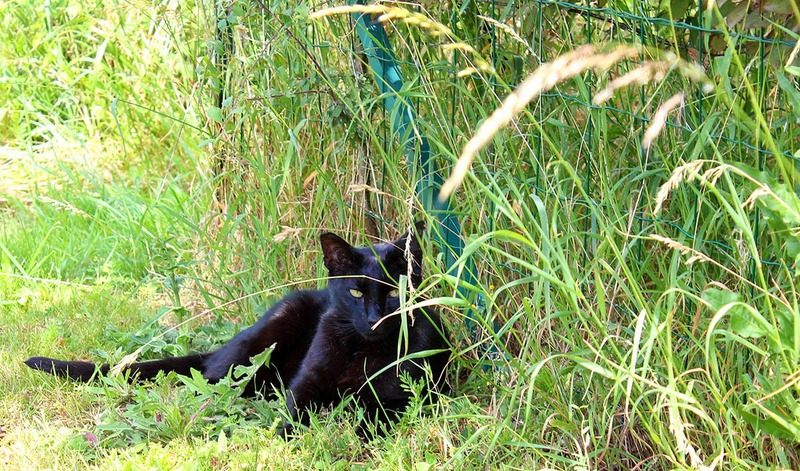 Bert the black cat in the grass. Here and there he'd sit and roll over on his back, his way of asking for a belly rub. I obliged, then he was off again to another spot. We did this for about five minutes before he sat next the fence in the shade. I snapped a few photos, of course. I think he was disappointed when I turned and went back into the yard. After I wrote yesterday's post, I got the camera out and took some pictures of the hydrangeas we planted out front. It doesn't look like much, yet. But it looks much neater than the wild mess of roses, camellias, and weeds that we replaced. When the shrubs grow taller and fill in, things should look a lot nicer. I'm hoping they'll eventually grow to the height of the garage window sills. The driveway and sun porch and the new hydrangeas on either side of the garage door. There are some potted plants in there, too, temporarily. We want to re-paint the white parts of the house on this side. Ken has already done the window sills on the other sides of the house, but we haven't done these yet. We probably should have painted them before planting, but it didn't work out that way. Now that the garden is (mostly) in, is it time to relax? Heck no! On Sunday I finished a project that was nine months in the making. Remember when I propagated hydrangea cuttings last fall? Now they're planted in the ground along the east front of the house. Ken and I dug up the tired old roses and two camellias (which he relocated to another part of the yard) last week. Callie waits for me between a row of vines and the tall grass. I amended the soil, added a little wood border, and finished off the planting with pine bark chips to keep weeds down and moisture in. Now we just need those little shrubs to settle into their new home and grow. I realize that I should probably have a photo of it here to go along with the text, but I haven't taken one yet. 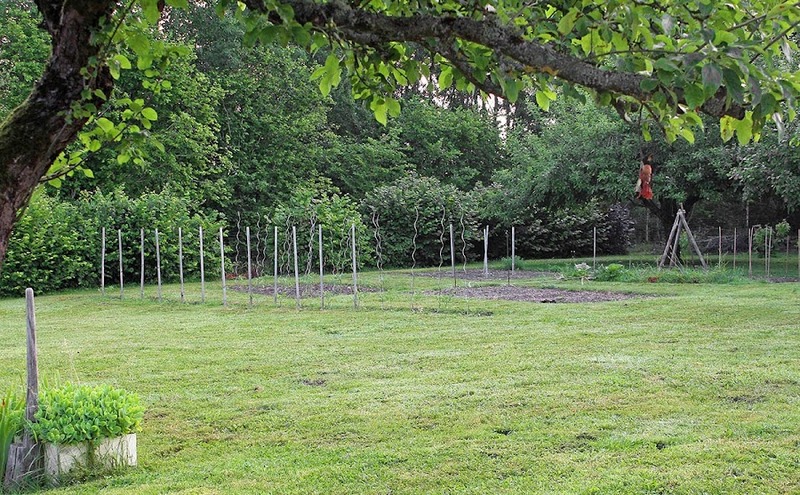 Most of the vegetable garden is planted. The tomato, eggplant, and pepper seedlings I started earlier in the spring are growing new roots and are getting taller. Many of the seeds I planted directly in the garden have sprouted. Now it's time to keep it all watered and work to keep the weeds down. The state of the garden today. Not much to see, yet. About a quarter of the sweet corn seeds I planted didn't sprout. I knew they might not because some of them were leftover seeds from a few years ago. I've since replaced them with new seeds. I also planted a row of green beans with leftover seeds without a single sprout after a week, so I'll get some new seeds this week and replant. One mystery remains: brand new cucumber seeds have failed to sprout. I put in some more and am hoping they'll grow. One day. Hopefully. If they don't get pruned away before the harvest, the grapes these buds will become will be made into tasty wine. 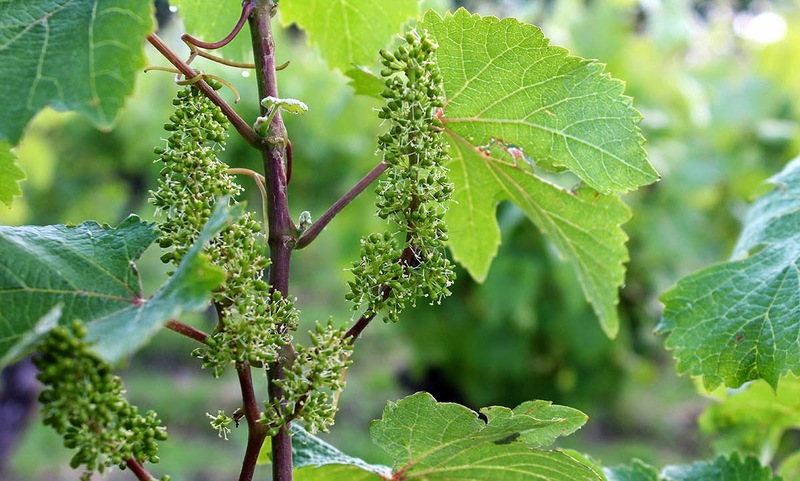 The flowers should open soon and then the grapes will form and ripen over the summer. When the fruit forms and grows, the bunches will bend downward. For now they point skyward. I can't tell you what kind of grapes they are. I've forgotten exactly where I took the picture, and I've taken many like it in different vineyard parcels. I don't know enough about grapes to accurately identify the varietal by the leaf shape, but these leaves look close enough to gamay leaves that I will guess that's probably what they are. 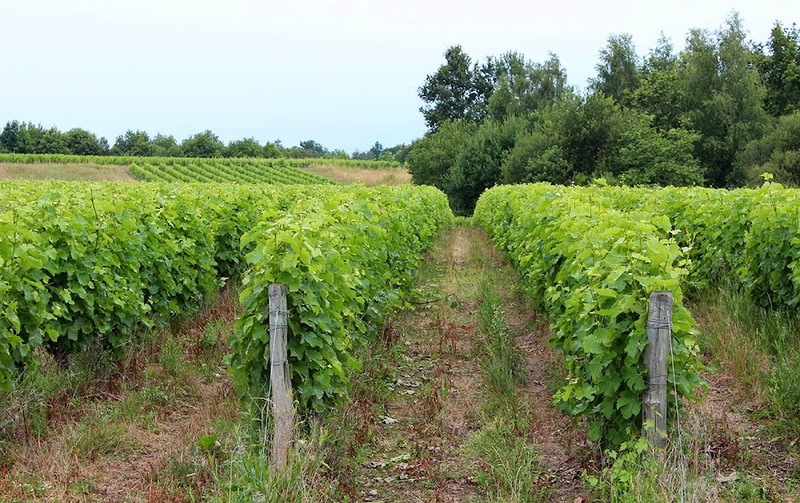 Gamay is one of the three red varietals grown around us, the other two being cabernet franc and côt. We're loving our current period of summery weather. 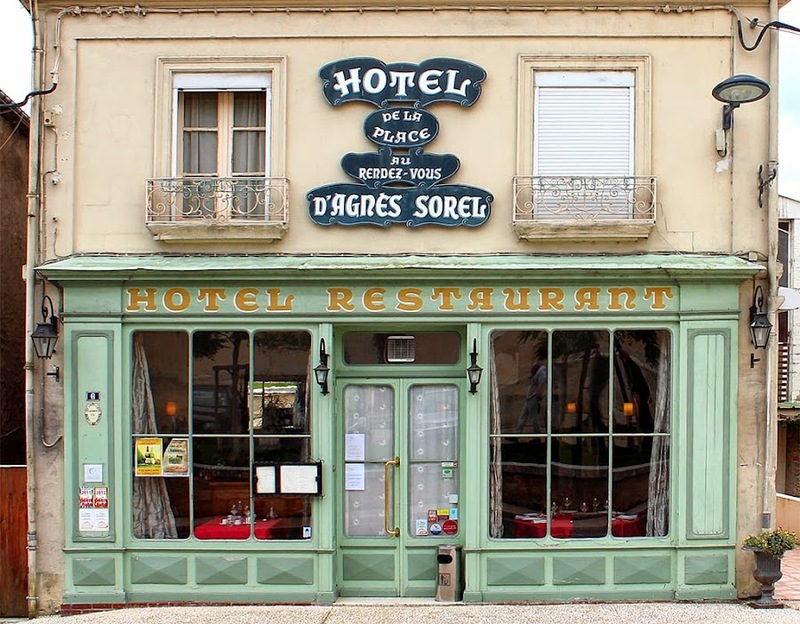 On Thursday, Ken and I enjoyed a leisurely lunch with our friend, CHM, on the patio of a very nice restaurant up near the Château de Chambord. After that we took a pretty drive along the Loire River to Blois, where CHM got a train back to Paris. 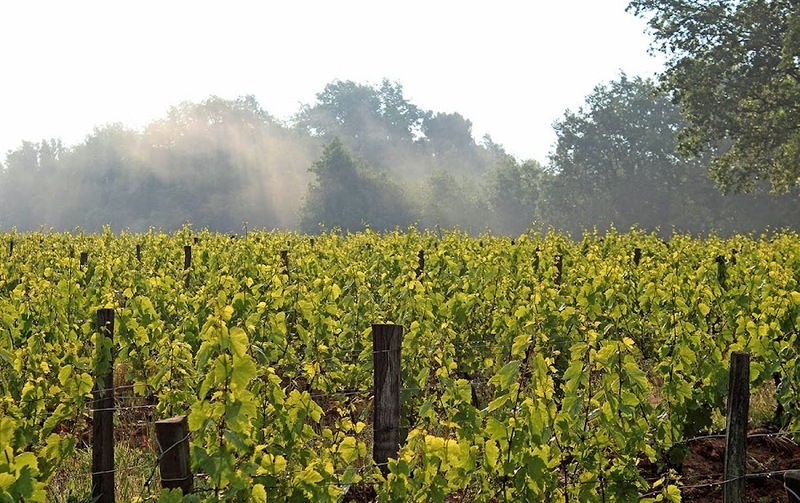 Mist rises from the woods next to the vineyard on a sunny morning. Today we plan to do some more outdoor work. Ken wants to clear out and clean our glassed-in entry porch for the season. We keep a lot of plants in there over winter and into the spring, but now many of them have been relocated outdoors, so it's a good opportunity to reorganize and clean. I'm going to finish cutting the grass (I started on Wednesday). There are a dozen little things that need to be done outdoors over the next couple of days, as well. Busy! Last week I shared a photo of me beside a swimming pool. And so I do again this week, but this one is from much earlier. The year was 1962. 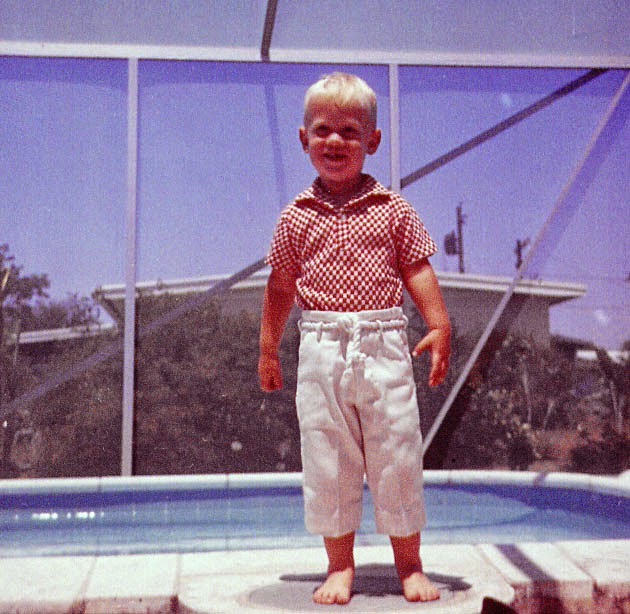 The place was my grandparents' house in Tampa, Florida. The outfit, well, I have no idea. A cross between Popeye the Sailor Man and Robinson Crusoe. Get a load of the blond hair! My father had very dark hair and my mother's hair was red. I got the blend. Of course, nowadays it's grey. The great leveler. Family legend has it that it was around this time that I thought it a good idea to jump into the pool. After I went under for the third time, my father decided he should probably put down his beer, get out of his lounge chair, and pull me out of the water. I, of course, have no recollection of these events. 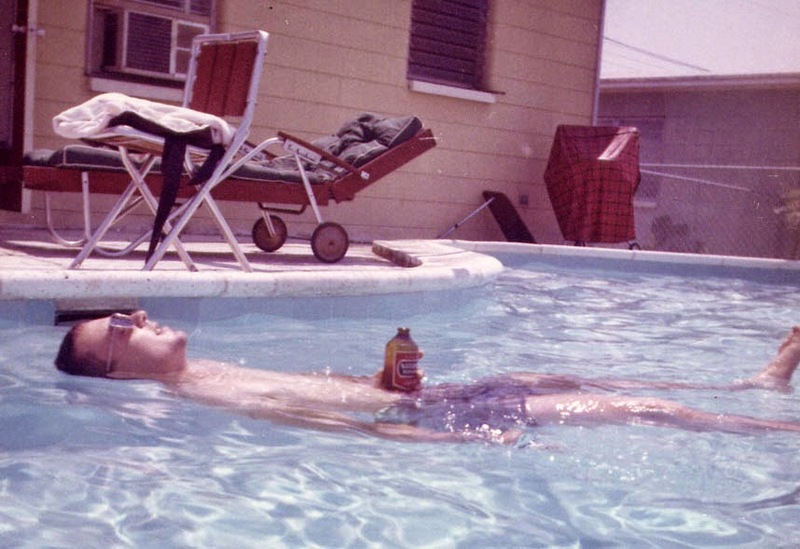 As a bonus, here's my dad in the very same pool, beer in hand, probably resting after the rescue. It's been a damp few days around these parts. We've had mostly sunny days with rain overnight or in the morning, except for Tuesday when we spent the day under scattered showers. At least we don't have to water the garden. 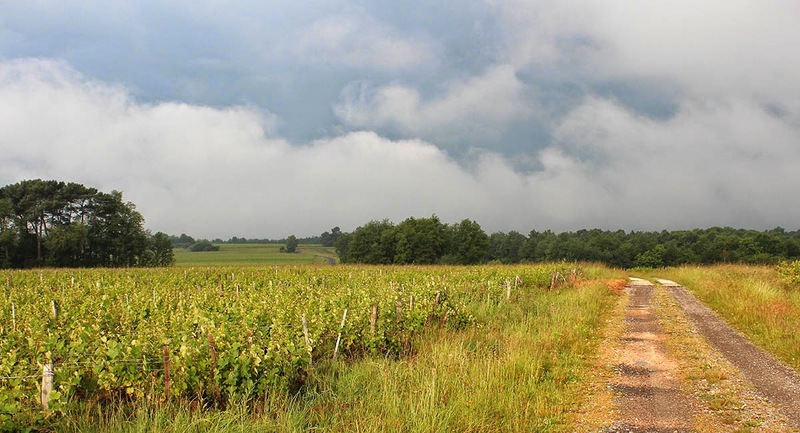 A vineyard view after a recent thunderstorm. I've been holding my breath with the storms hoping that we don't get serious hail. Not only could large and sustained hail damage our roof, but it could also destroy our vegetable garden and seriously damage crops (including grapes) that so many in our region depend upon. So far, so good. Recent warm weather has brought us thunderstorms with lots of sound, light, and rain. And we even got a little hail (very little, thankfully). The storms have come overnight or early in the morning, after a day of sunshine and humidity. Storm clouds clear off on Sunday morning. Things are expected to calm down for a while now. We need some dry days to continue our garden work and I need to get the grass cut before it gets any taller. 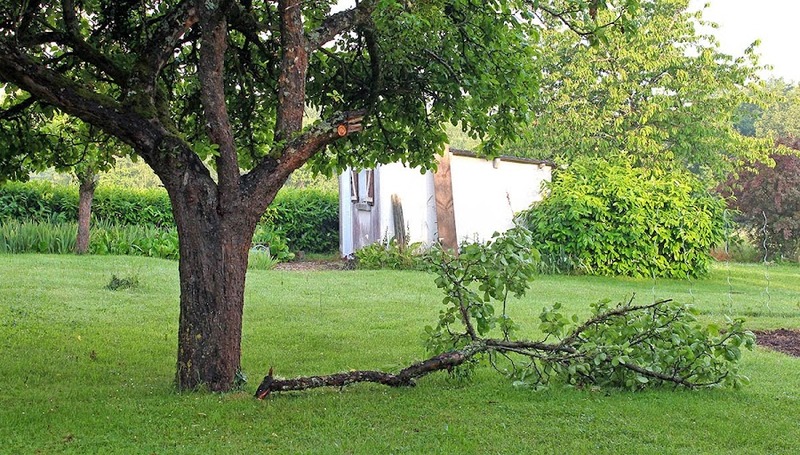 The big old apple tree in our back yard is falling down. Little by little. This weekend we lost yet another branch. It didn't separate from the tree, but over the course of three days it bent down and touched the grass. I sawed it off on Saturday. Another one bites the dust. Or, in this case, the grass. Now I've got to cut it up and put it into the wood pile for burning. We lost a larger branch from this tree last year, and another big one came down in 2011. The tree is not entirely healthy and now it is lopsided. One day I will have to decide to take it down altogether. 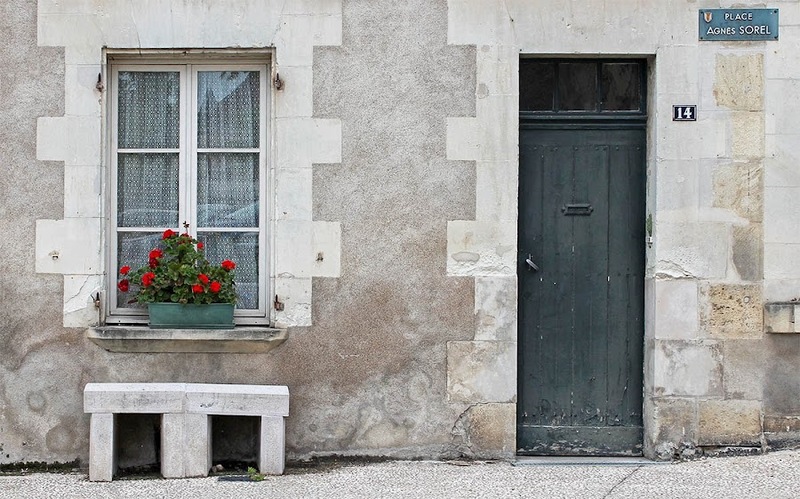 Here's another view from just outside the restaurant in Genillé where we had lunch on Tuesday. It's a very picturesque little place. Geraniums in a window box. So very French. We've been eating couscous for days, having made a huge pot of the stuff. It's still delicious. On Saturday I bought some clams at the market in St.-Aignan and we had linguine with white clam sauce for lunch. Yummy. I'm trying another experiment in the vegetable garden this year. I read on the internet that many growers of cucumbers train their plants vertically so that the fruit grows freely in the air. Gravity works to keep the fruit from bending, resulting in long, straight cucumbers. 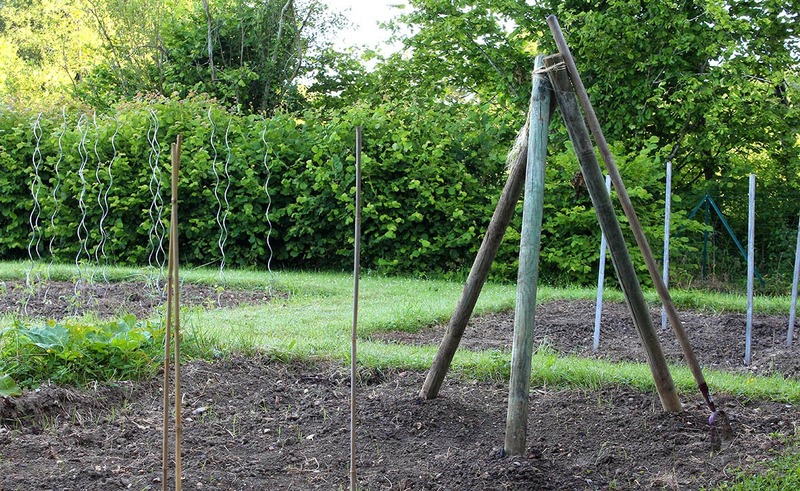 So I've built a tripod from some old fence posts we have hanging around and planted cucumber seeds at the bottom of each leg. The cucumber tree, stage one: the seeds are planted. I'm hoping to train the plants up the legs of the tripod so that the fruit will grow suspended in the air. In the meantime, I've planted some coriander seeds under the tripod. It grows quickly and we should be able to harvest it long before the cukes form. This is the restaurant where we had lunch on Tuesday. It's called Au Rendez-vous d'Agnès Sorel after the famous mistress of King Charles VII in the fifteenth century. She died very young after giving birth to their fourth child. We sat at the table in the window on the left, with a view of the town's 11th century church. The king was so taken with her that he accorded her several properties around France, including Loches in the southern Touraine region. It was Agnès who had the renaissance castle built there. Her body is entombed in the church adjacent to the château, but her heart was taken to the abbey at Jumièges in Normandy. We enjoyed a leisurely lunch at the restaurant. As I mentioned earlier, Ken will probably share his photos of what we ate there. Since we're expecting some warm days ahead, I thought a pool picture would be appropriate. 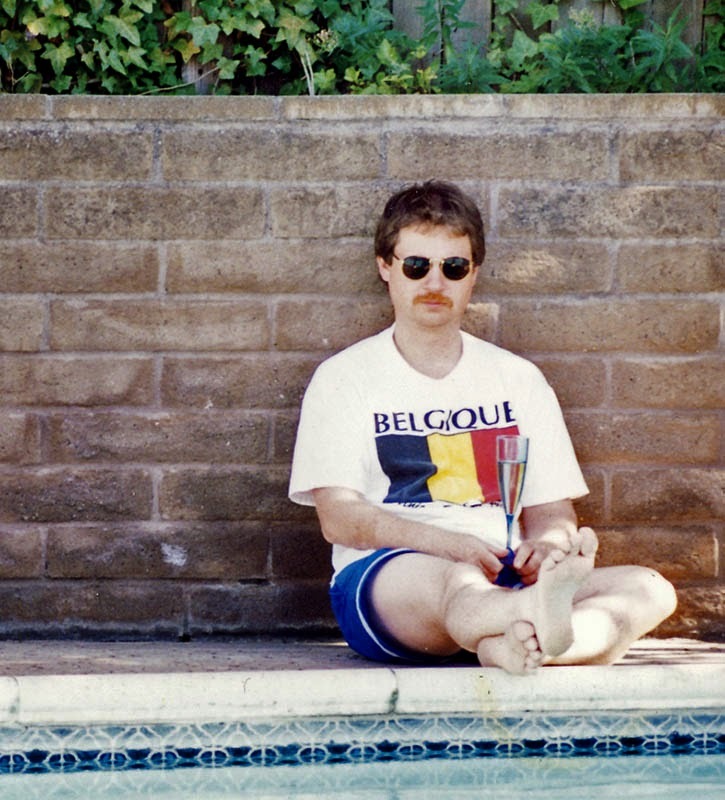 Here I am chilling out beside a friend's pool in California, sometime in the mid 1990s, some twenty years ago. I'm likely sipping a California sparkling wine in a plastic flute. Poolside safety and all that. This is a section of a larger photo that included our dog at the time, Collette, sitting not far from me. Unfortunately, I cut her part of the photo out to put in a frame. This was in the days before I had photoshop and could do that digitally. I still have that part of the photo in its frame, though. On Tuesday we ventured out to lunch with our friend, CHM. The restaurant is one we have been to several times over the years. It's located in a small town about a half-hour south of us. There were six customers: the three of us, a couple, and another man. The hostess (the chef's wife) is very friendly and welcoming. 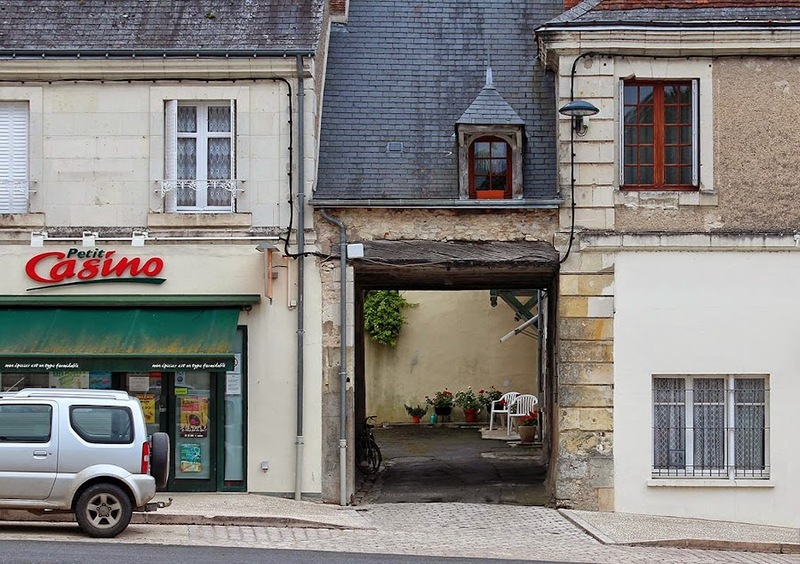 Not far from the restaurant is a little grocery and this inviting little courtyard. Too bad about the car in the shot. After a delicious lunch I took a few photos out in the front of the restaurant. Ken and CHM took more pictures than I did, including the food we ate, and some of them will likely show up on Ken's blog in the coming days. Today it's raining, but we're expecting a kind of heat wave for the weekend and the following week with temperatures predicted to go into the high 20sC (around 80F). That will be good for the vegetable garden! This post is basically a way for me to document the progress of the garden. First up, the tomato plot. I put sixteen of my seedlings in this square. There are four varieties of tomato represented. But don't worry, I've got about sixteen more tomato seedlings (other varieties) to get into another plot. 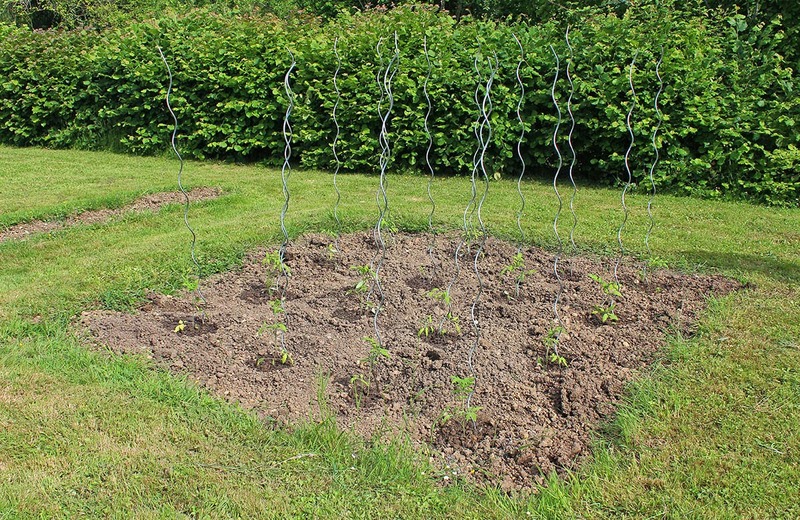 Little tomato plants and their supports. I'll post another photo later in the season as they grow. I plan the get them in today, along with the eggplant seedlings and some zucchini and winter squash seeds. I've also planted the corn, thirty-six seeds, four in each of nine mounds in another square plot. Winter squash will go in between the mounds and I will plant climbing beans among the corn plants once they sprout. And then there's the cucumber tree (more about that later). This year, for some reason, the calla lilies are looking very nice and have many flowers. I had almost given up on them. I suppose the mild winter and all the rain we had have something to do with it. 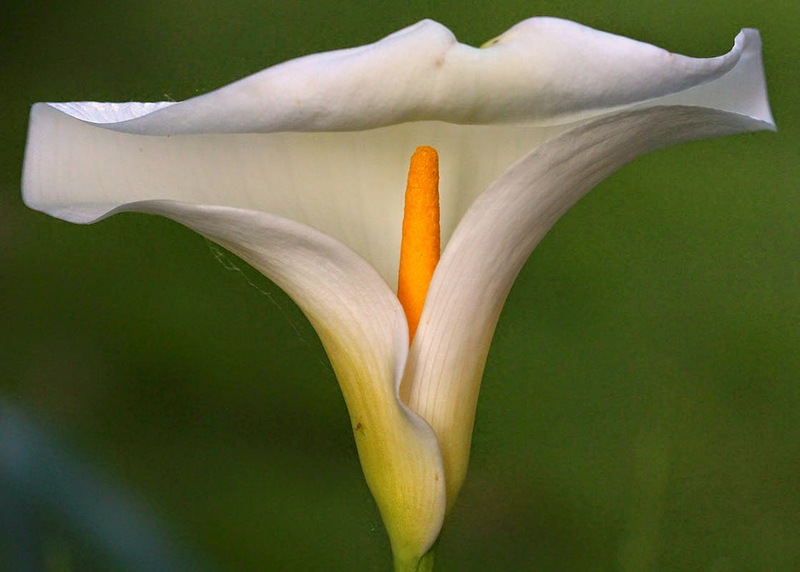 A calla lily flower. In French it's called arum. The vegetable garden is getting planted. I put in sixteen tomato plants, eight bell peppers, and sowed a bunch of cucumber seeds on Sunday. Today I'm hoping to finish with the remaining tomatoes, put in the eggplant seedlings, and sow the corn seeds. Ken might till up the remaining garden plot which is slated for summer squash. Today, June 1, marks thirty-one years that Ken and I have been living together. We moved into our first apartment on Capitol Hill in Washington, DC, all those years ago. I think we're getting the hang of it now. I think we should re-brand the 31st year as the Artichoke Anniversary. According to the Hallmark people (and they should know), the official 31st anniversary gift is "travel/tourism." Well, Ken just got back from Paris. I went to the market in Saint-Aignan. 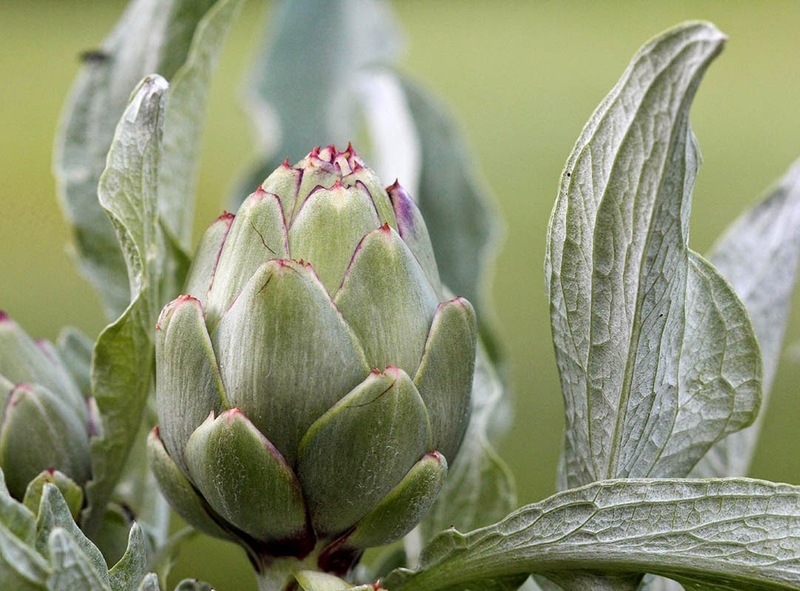 And taking a tour around our garden yields all manner of lovely sights, like this artichoke.